Greek Public Policy Forum - Ελληνικό Φόρουμ Δημόσιας Πολιτικής: Who Controls the IMF? Public perception is different. Consider a recent article in the New York times, citing an unnamed IMF official stating that the IMF program for Greece “would have to meet our criteria,” and in particular that “[o]ne of those criteria is debt sustainability.” The article suggests that the IMF’s “aggressive stance sets up a standoff with Germany and other eurozone creditors, which have been reluctant to provide additional debt relief.” The article is exemplary of a broad misunderstanding of what constitutes the IMF. Rather than an independent organization governed by rules that apply to all member countries equally, the IMF is dominated by a small number of countries. For the time being, these countries form a coalition making sure the IMF will stay involved in Greece. As long as the governments of countries like Germany, France, and the United States stay committed to the program, and reducing the Greek debt, they will also keep the IMF involved, much to the horror of IMF staff and its Managing Director, Christine Lagarde. The dominance of political interests of the Fund’s major shareholders can be illustrated along a number of dimensions. First, consider the election of its Managing Director. If you hope that filling the top job in the IMF is mainly according to qualification, you will be disappointed. First of all, it’s about politics. Traditionally, Europeans nominate the Managing Director of the IMF, while the President of the World Bank is an American in return. EU leaders first agree on a common candidate for the top job at the Fund. If the candidate is acceptable to the United States, she will be it. The EU has a total of a voting share of about 30 percent in the Executive Board, the electoral body, so that in tandem with the United States – and voting by simple majority – the common candidate can be easily enforced. Second, IMF loans frequently go to countries with irresponsible economic policies. The disbursement of loans is formally linked to strict conditions, designed to better these policies. Politically well-connected countries can however risk breaking the conditions without losing access to the Fund’s money. Again, the decision about whether to disburse the next tranche of money will be made by the Executive Board, which means that the G-7 countries and especially the United States have the final say. IMF-clients where these important member countries have some stakes will not lose access to the Fund’s loans – even if Fund staff and its Managing Director would wish otherwise. Countries that are important for the Fund’s major shareholders have a higher probability to receive IMF funding, at better conditions. 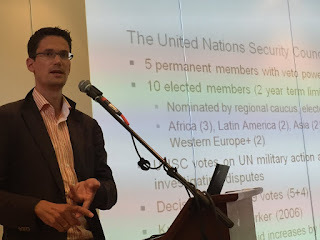 The empirical studies I've done with my colleagues Jan-Egbert Sturm from ETH Zurich and James Raymond Vreeland of Georgetown University demonstrate that temporary members receive more IMF loans in the UN Security Council. We have calculated how often countries have received IMF loans if they were a member of the UN Security Council or not (see Figure 1 below). It turns out that membership on the Security Council increases the likelihood of obtaining an IMF program by 6 percentage points. 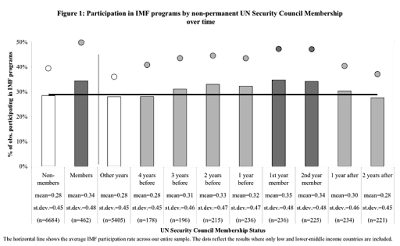 This probability increases even before a country is elected, as it is often known several years in advance which country will be elected to the Council. Immediately after leaving the Security Council the frequency with which countries are under an IMF program falls. Source: Dreher, Axel, Jan-Egbert Sturm and James Vreeland, Global Horse Trading: IMF loans for votes in the United Nations Security Council, European Economic Review 53: 742-757 (2009). The results of our studies show that temporary Security Council members not only receive more loans, but that they receive them on better terms than non-members. They get higher loan amounts when they vote more often with the United States in the Council, and smaller loans otherwise. These results hold if we control in a statistical model for other influences on lending. They suggest that the United States used the IMF to support their geopolitical interests. A 2006 study from the US-economists Kuziemko and Werker showed that bilateral loans from the United States go rapidly upwards once a country is elected to the Security Council. The United States uses its foreign aid to influence voting in the Security Council, and applies its influence in the International Monetary Fund to support this goal. Another example of the importance of political influence in the IMF are its economic forecasts. These are systematically too optimistic with regard to economic growth. Inflation forecasts for countries that vote in the United Nations General Assembly with the United States more often, get better forecasts than others, on average. This result of my study with Vreeland and the Italian economist Silvia Marchesi further highlight the importance of political horse-trading: positive forecasts in return for votes at the General Assembly. Overall, it should be clear that the decision on whether or not to extend further loans to Greece is not the IMF’s to make. The largest shareholders of the Fund will make this decision, based on their strategic interests. They finance the IMF and consequently determine its policy. Of course, this does not imply the IMF will support Greece for whatever it takes. If Germany, the United States, and other major shareholders decide that the time has come to abandon Greece, they might well use the Fund as scapegoat. The will make the Fund stop lending and then pretend that without IMF involvement their own support for Greece cannot be maintained. Unnamed IMF-officials will be quoted saying that IMF support cannot be maintained, given that important conditions have been breached, and debt became unsustainable.